Pulborough head coach Simon Clayton says they have ‘reached the pinnacle’ after clinching the London 3 South East title on Saturday. Having secured their promotion the previous week, they picked up the title the hard way as they missed out in their required bonus-point win against Lewes. 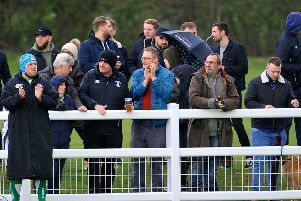 It was a nerve-wracking final day of the season as despite their 17-10 success, they had to rely on Haywards Heath also failing to get the bonus point. That came to fruition and Pulborough were named league champions by just a solitary point. There was great excitement around the club when the result from Haywards Heath came through, but Saunders knows the work required in stepping up a division. He said: “We’ve reached the pinnacle, we’re just a little village club. “We want to build a solid club, get the second team promoted so we have lots of player to call upon who are playing at a high level. With Pulborough 2nds finished second in the Sussex Division 2 (Canterbury Jack) promotion is a real possibility going forwards. The first team meanwhile lost just three games all season and they have a pragmatic approach as they look to establish themselves in London 2 South East. Club captain Simon Burfiend said: “We have a really good group of core players, most with more than five years of playing left and we’ve got some really good youngsters coming into the pack. n Full story, report and picture special on page 83.